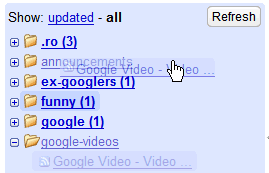 Google Reader now shows a list of recommended feeds in the new Discover section. The list is generated by looking at the subscribed feeds from other people that have similar interests with you. I'm pretty satisfied with my recommendations, although I knew most of the blogs from that list. "Your recommendations list is automatically generated. It takes into account the feeds you're already subscribed to, as well as information from your Web History, including your location. 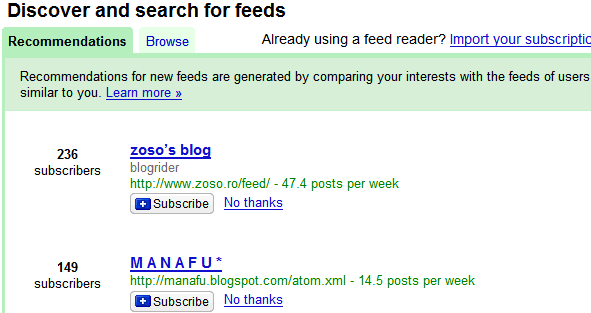 Aggregated across many users, this information can indicate which feeds are popular among people with similar interests. For instance, if a lot of people subscribe to feeds about both peanut butter and jelly, and you only subscribe to feeds about peanut butter, Reader will recommend that you try some jelly." To decide if you want to subscribe to the feed, you can look at the number of Google subscribers, the frequency of posts or preview it. But the most important update is that you can now manage your feeds in the sidebar using drag and drop. This allows you to move a feed to a new folder, to change its position inside a folder or to change the order of folders, if you don't like the alphabetical order. For some reason, there's still no option to rename folders and tags. Google Notebook is a updated too. Unfiled now is unfiled bookmarks and has it own spot in the sidebar. I'm pleased with the recommendations feed so far. However, it would be nice to get a little more information as to where the recommendations come from. As they do at Amazon, when you subscribe to something, they could say, "X number of readers who subscribe to this feed also subscribe to this one." True Amazon doesn't quantify but that's what I'm looking for. More transparancy please: I want to know what my existing feeds and my recommended feeds have in common. "because you subscribed to Slashdot and Reddit"
"because you subscribed to SEO-related blogs"
"because you're from Germany and this blog is popular there"
"because you searched for XML, RDF and OWL"
"because you visited Google Maps and Google Earth"
Help! I'm experiencing cognitive dissonance! The Reader UI that I'm using to read this very article is not the one the article describes! So you're using an iPhone, a Wii, a mobile phone or you have the privilege to test a new Google Reader interface. What do you mean by saying no way to rename tags? What tags do you mean? There is a way to edit tags for particular post. Also, you can rename any subscription. I'm still waiting for them to add the ability to temporarily disable, rather than unsubscribe from a feed. It seems like a pretty obvious requirement to me. Liking the suggestions feature - I just added a feed though it and will go back later and add more (as if I don't have enough to read already!) - folder drag and drop is good too, like you say, we really need to be able to rename tags and folders though - you'd think it's be an easy change to implement? - My 2 cents.